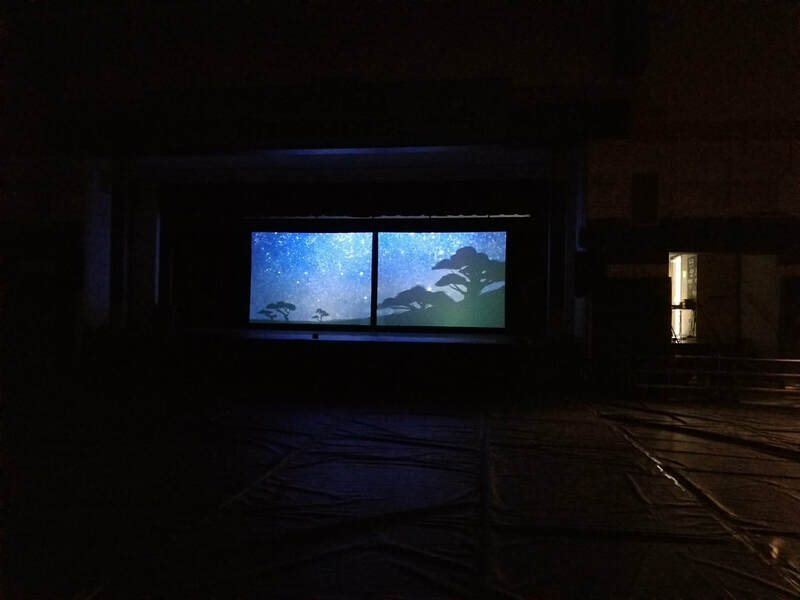 Final Preparations for Lion King Jr! 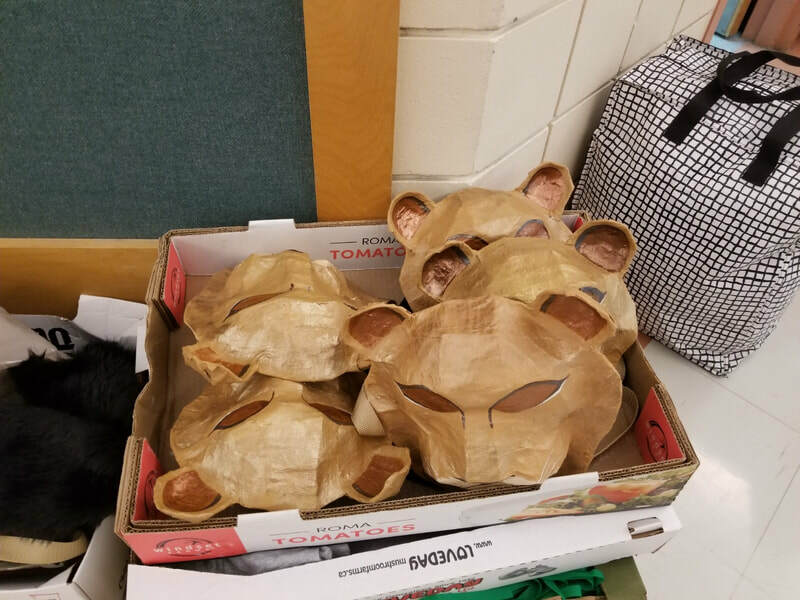 Sean's middle years students are getting ready for their Lion King Jr. performances next week. He has an amazing team of teachers and parents that help put together an incredible show. 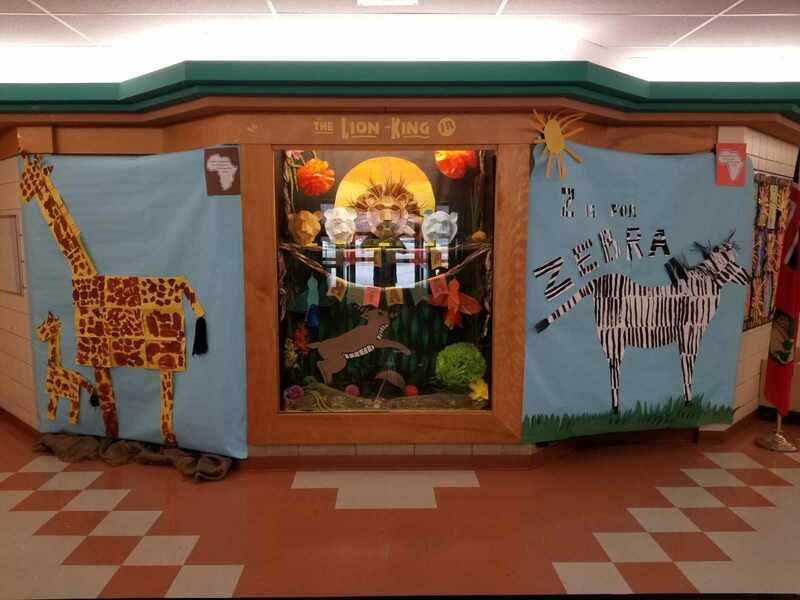 Here are some photos of the school display and costume pieces. Are you planning a spring musical? What are you doing? We would love to hear about it below in the comments! We are still in the depths of winter but here is something to warm up your little kiddies voices! Click HERE for reproducible vocal slide cards to print and use with your students now! Also included are blank buzzing bee warm-up cards. You can use these for students to create and notate their own vocal slide compositions! Sean and I had the pleasure of presenting at this year's Saskatchewan Music Conference! What a wonderful time we had working with Saskatchewan Music teachers this past weekend. It's always so great connecting with others and to be energized by the passion of others. We are beginning to see familiar faces as we continue on our journey of presenting! It is both exciting and inspiring. We and presented A Symphony of Seasons, Learning through Light and The Sound of Colour. All well received. It was a pleasure Saskatchewan! Self-Care Goals for the School year! A few weeks back we posted our goals for the school year and included surveys to see what people were already doing in regards to those goals. 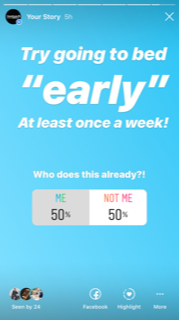 We had some pretty interesting results! Here are our official self-care goals for the school year! This may be different for everyone. "Early" for Steph is 9:00 pm. "Early" for Sean is 11:00pm. Strive to catch up on sleep and let your body rest at least one day a week whatever your "early" is! 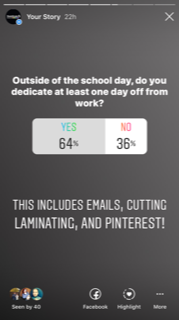 Choose one day a week to dedicate to non-work things outside of school hours! No work at all! No planning, working on materials, etc. If you are really ambitious, do not even check your work e-mail! This one is tough for both of us. 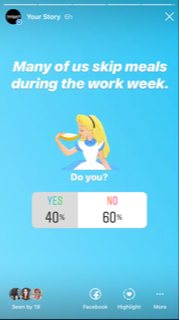 We often skip meals because things are rushed in the morning or because we are busy working through the lunch hour planning, or running extra-curricular groups. Eating breakfast and lunch is so important and we need to remember that! 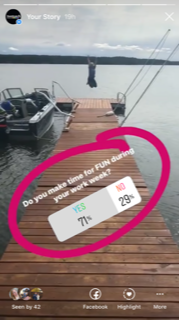 Whether it is reading a book, having a glass of wine with a friend, going to a movie, or spending time at a park with family, make time for fun at least once a week (preferably more!)! Exercise does wonders for our mental health. Going for walks, or going to the gym on a regular basis (1-4 times a week) will be part of our goals this year! Ray of Light - Demo Video! The demo video is up! This choreographed movement is for Madonna's Ray of Light (radio edit version because it is shorter). The dance is for grade 3 and 4 students using finger lights. 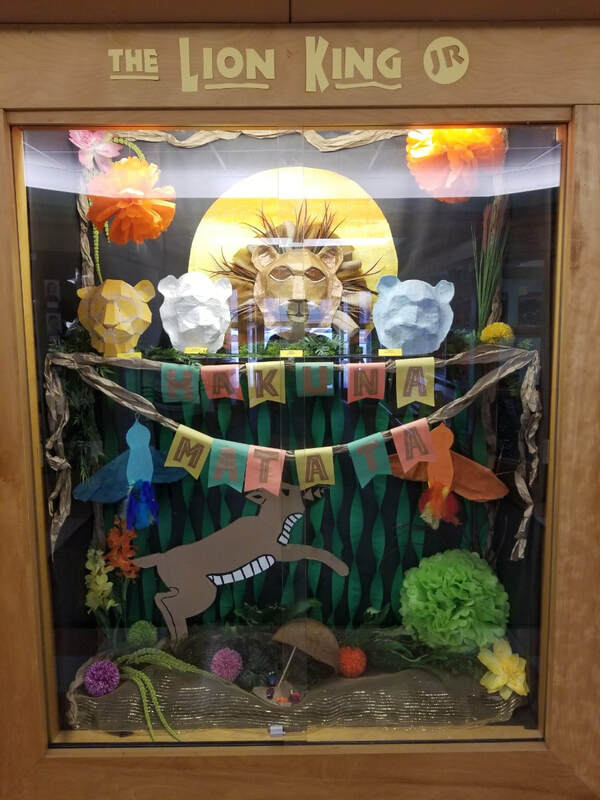 It can be used in conjunction with our other Light unit activities, or on its own, as a performance piece, or simply as a classroom learning opportunity. These nifty finger lights can be found at the dollar store. 4 in a pack! We have had an overwhelming response to this piece at our workshops. You love it! And the kids love it! Farm Books for the Music Room! We love using books in the Music room! As many of you know, we also love thematic teaching! A farm unit for kinders is a great way to start the school year. There are many traditional songs about farm animals that many of us already do (Old Macdonald, Baa Baa Black Sheep, Three Blind Mice, etc.) that can easily be incorporated into a farm unit. 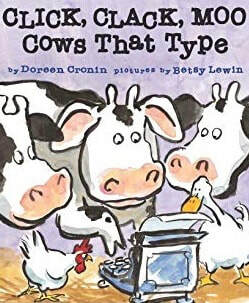 There are a ton of farm themed books out there and books are a great way for students to connect story and sound. Picture books can be used in a variety of ways in Music class. Soundscapes using non-pitched and/or pitched percussion can set the mood of a story, an instrument sound or motif can be used to represent a different character in the story, an instrument can be used to portray a sound effect, and the list of possibilities goes on. Some books can act as a framework for movement exercises and some can even lend themselves to vocal warm-ups. Below are some great books to use as a focus of individual lessons or within a farm unit for your primary classes! Who uses some of these books already? 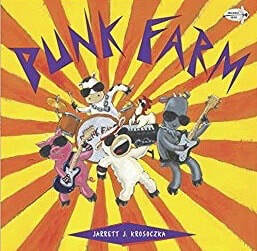 Do you have any other animal or farm themed books that you use for Music? We would love to hear from you in the comments below! 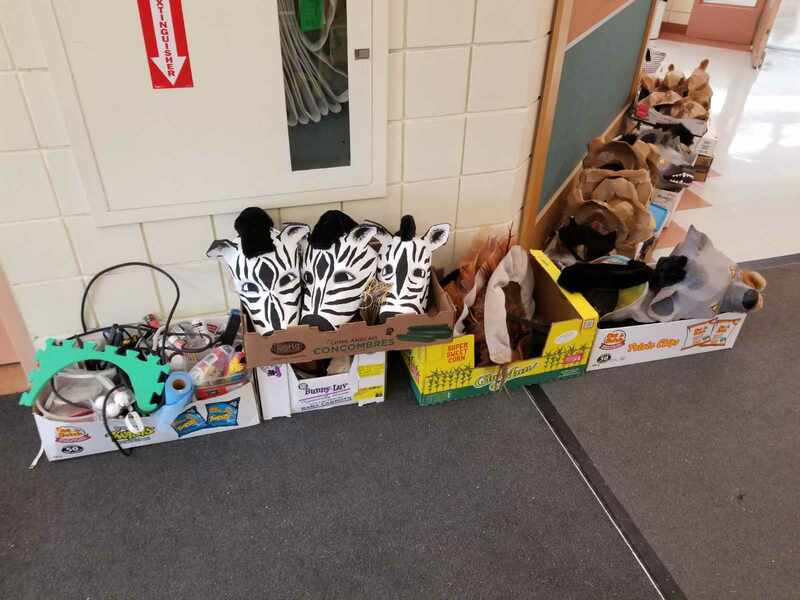 Summers Toys for the Music Room! Whether it's Dollar Tree or Dollarama, I think we can all agree that the dollar store is a great place to find treasures for the Music room! We have found spring and summer to be especially good times to get things. Summer will be coming to an end and it's time we all make sure to pick up these great teaching tools before it's too late! We love pool noodles! Using a bread knife, we cut pool noodles into pieces to create "beads" with a rhythm drawn in permanant marker on each one. Use string, a bungee, or even a dowel to create rhythm patterns by stringing on the pool noodle pieces. Create longer pool noodle pieces to demonstrate a variety in duration. Use colours to help identify different rhythms if you wish. Here, we have cut blue spacers as our bar lines. Ribbon wands are excellent movement props. 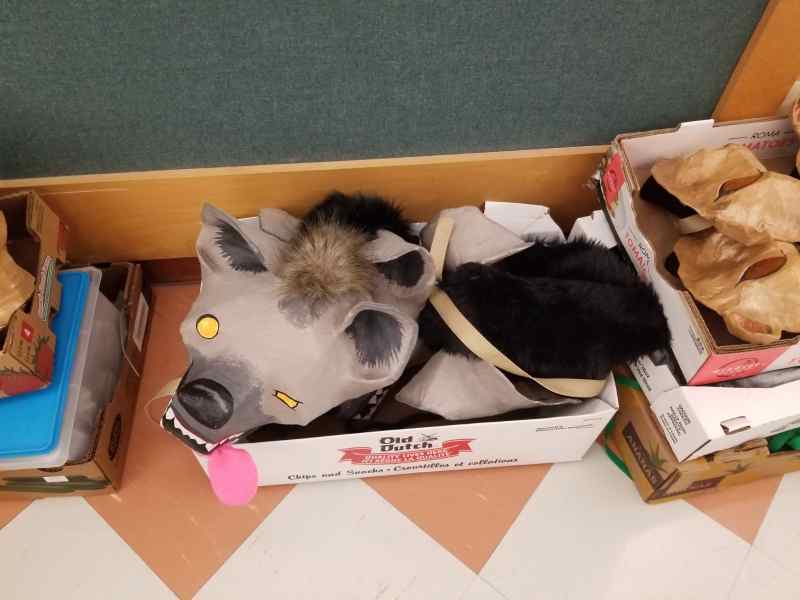 They can be used to demonstrate phrasing, to enhance the visual musicality of a piece, to connect to a mood of a piece, or even as vocal warm-up tool! Bubbles are a fun way to visually demonstrate when music and/or movement is light as opposed to heavy. Another idea is to identify a reoccurring theme or sound in a piece your class is listening to and every time it presents itself, students pop a bubble! 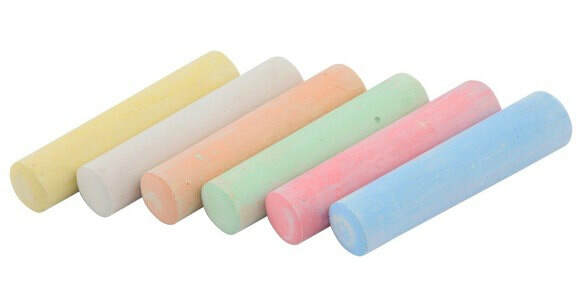 Chalk can be used to write out rhythms during a dictation exercise. Add even more fun by doing rhythm activities outside! 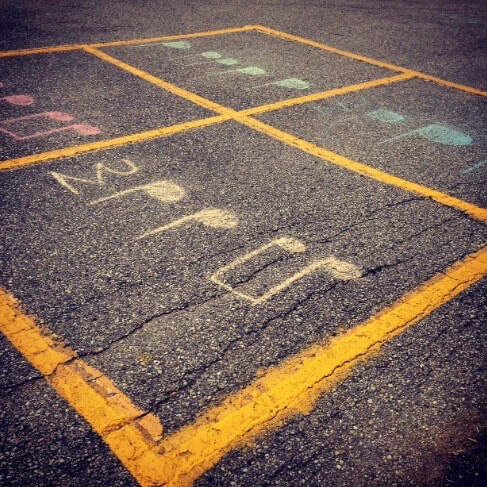 Click HERE to try our outdoor rhythm game Rhythm Squares! We use these in our Tons of Bugs workshop! Turf squares can be bought at most dollar stores and can be cut into four pieces to use as beats when having students create rhythm patterns. We use the four small pieces to visually demonstrate beat and when a bug is placed on it, the bug word becomes the rhythm. A four beat rhythm pattern is created by each group of students. Super fun! The neatest thing happened the other night! Steph was at the Winnipeg Folk Festival Main Stage watching Sheryl Crow and noticed that a large group of children were sitting in a circle playing Beatmaster! Organized all by themselves! To the beat of the music they were listening to! It seriously warmed her heart and she asked the kids if they learned the game from their Music teacher. The children explained that a few of them had, and then taught it to the rest of the group. They loved it and played it for almost the entire set! What a wonderful sight to see. It seriously left Steph warm and fuzzy for the rest of the night. Have students sit criss-cross in a circle facing the middle. Choose one student to be the "Detective". This person will leave the circle and must close their eyes. It may work better if the Detective momentarily leaves the room. Keeping it a secret from the Detective, choose a "Beatmaster" making sure that the rest of the students know who has been chosen. The circle of students will begin keeping a beat on their laps. The Detective will return and stand in the middle of the circle. The Beatmaster will change where the beat is (floor, lap, head, clap, etc.) and the other students will follow suit, still trying to keep the identity of the Beatmaster a secret. The Detective has to figure out who the Beatmaster is! They will have three guesses. Once the identity of the Beatmaster has been revealed, a new Detective and Beatmaster will be chosen. As an extension, the Beatmaster can choose a rhythmic ostinato rather than solely keeping the beat with ta. The game continues as long as you and your students wish! We had a wonderful time at the Carl Orff Canada National Conference CASCADE in Niagara Falls. Sean brought his Orff Club all the way from Winnipeg to perform! 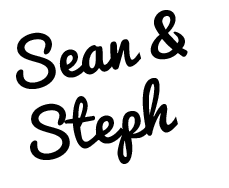 Since Steph is now up north and no longer in the same city as Sean, she was unable to help out with the performance this time. 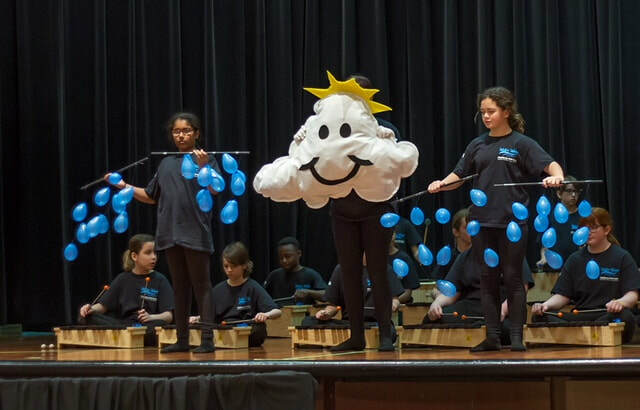 However, she packed up the whole family and made it to Niagara Falls to participate in the conference and to see the Highbury Orff Club perform! It was so neat to watch them in action from an audience member's point view! ​The Highbury Orff Club performance, entitled WATER WAYS, was based mostly on music from Orff-Schulwerk Spielbuch für Xylophon (Play Book for Xylophone). It is a series of three books by Gunild Keetman, published by Schott Music International. As the title implies, the pieces are all written for xylophone. What we love best about these pieces, as with most Orff pieces, is their musical richness and sophistication, yet when they are broken down, they are derived from a pure and simplistic basis. Below is a list of the pieces that Sean, his Orff Club and friends Julie and Heidi arranged for WATER WAYS! It was such a great experience for Sean's students to prepare and perform such excellent music from the volumes! They had a great time in Niagara Falls at the conference and the audience thoroughly enjoyed the performance (including Steph)!